The Australian Women’s Weekly has become an institution for home cooks all around the country for more than eighty years. Over the years the Australian publishing icon has been influencing kitchens all across the country, teaching things such as the basics of baking to complex and delicious dinners the whole family will enjoy. If you’re always struggling to figure out what to cook for dinner or what sweet treat to bring to a dinner party, look no further than Kitchen. The companion piece to the best-selling Cook, all the recipes in this massive book has been triple tested in the Australian Women’s Weekly Test Kitchen, ensuring you’re left with the finest recipes and the highest-level culinary creations. This cookbook is divided and sorted by the kitchen equipment used, from The Frying Pan, The Wok, The Pie Dish to The Microwave Oven and The Griller. Kitchen also includes dozens of special features introduce you to all sorts of methods and skills, from preparing poultry to handling pastry and tips for cooking the perfect barbecue time and time again. Whether you’re a first-time cook or an experienced chef, you’ll get lost in this best-selling cookbook by the Australian Women’s Weekly. 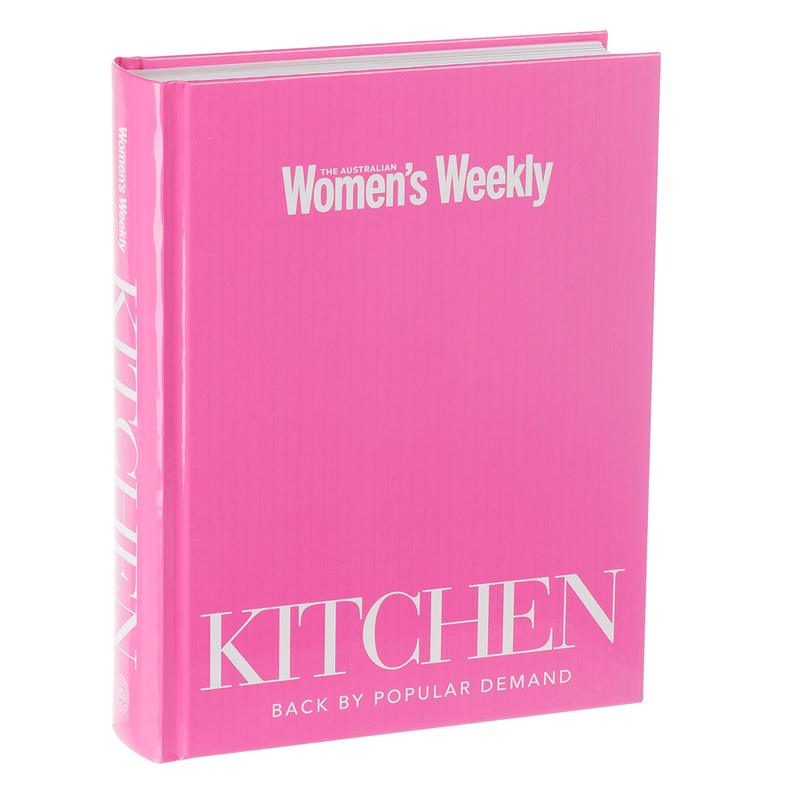 Filled with hundreds of recipes and advice straight from the Australian Women’s Weekly. Each recipe has been triple-tested in the Australian Women’s Weekly Test Kitchen. Features twenty-five chapters, separated by the equipment used to cook each recipe from The Grill Pan, The Boiler, The Bread Tin and many more. Filled with dozens of special features that introduce you to particular skills and methods from steaming methods, preparing seafood, handling pastry and more. Begins with an introduction penned by Pamela Clark, the Director of the Australian Women’s Weekly Test Kitchen. Includes an introductory chapter titled The Ideal Kitchen filled with tips on planning a kitchen, bench heights, equipment, food storage and kitchen maintenance. Includes conversion charts, a full glossary and index at the back of the book. Dimensions: 20cm (l) x 25cm (h) x 5cm (w).